Thank you! I was a little anxious since it was my 1st real interaction with him let alone a 1st with a BOA. I’m very much looking forward to our next session which will probably be tonight when I make some modifications to the enclosure (add UTH to cool side and add more holes to help bring down the humidity (80%). Appreciate it my Georgia Snake Keeping Brethren! I’m really enjoying this little guy. Does anyone think I need to put something ‘rough’ in the tub to aid w/ shedding? Currently I have two small hides, a water dish and scott towel substrate. I was trying to keep it minimal since it’s a Quarantine enclosure where it needed to be easy to detect mites. @ CK- I would put something rough in the QT tub to help them shed. I need to drill some more holes in my QT tubs also. Last edited by EL-Ziggy; 08-20-2018 at 11:11 AM. Well I just joined the club and there’s nobody to blame but myself. My baby boa tagged me at least two times tonight. I’ve been handling him for short periods of time every night this week and tonight I thought it would be a good idea to get the wife and kids involved. Well I guess it was just too much and he tagged me multiple times while I was wrapping up the handling sessions. This is the 1st time I’ve been bitten by a snake and the ‘unknown’ turned out to be not that big of deal. In fact, I barely even flinched and actually was surprised to see blood. Hopefully I didn’t do any damage to the bonding process. Congrats on your very first bite! Phantom could have been stressed with to many hands handling him., but thats just I thought! I'm sure it didn't ruin your bonding situation with him. Just take it slow and maybe limit the hands that hold him until he builds more trust and confidence with you.. I think you’re exactly right! I had my wife and two kids (ages 2-4) trying to get involved so it was pure chaos. I don’t blame Phatom for resorting to a bite. He was getting pretty squirmy right before the bite so it makes sense. Before that, he was wrapped calmly in my wife’s hands. Tomorrow is feeding night so he’ll have 3 nights of non handling. First, welcome to the bite club. The anticipation or fear of a bite is almost always worse than the bite itself. Secondly, I agree, it was just too much too soon for him. He's tiny and not used to handling. That means he will get scared very easily. Slow down. Shorter, less hectic handling sessions for a while. Build trust. Also, in your response (above), you nailed it. He was "getting pretty squirmy." He warned you and told you, ENOUGH! You didn't listen. I've never been bitten by my BP Shayna, but I know when she's done with handling. Usually 10-15 minutes in (tops) she starts getting really active. If I don't listen and put her back, she gets stressed; a little more darty and can even breath heavier. As you learn to get to know Phantom, and vice versa, you will learn to read him better. He sounds pretty chill otherwise, especially for not being handled much, and will 99% grow out of this stage with continued gentle handling and with size. I wouldn't worry about ruining the bonding. It's an isolated incident. He won't hold it against you. Learn and move on. Were your kids and/or wife freaked out? Also, good you didn't immediately throw him back in his tank. You don't want to reinforce that he gets what he wants if he bites. It was probably a minute later, which is plenty of time for him to not make a connection. So as he started to get squirmy, the warning signs started to go off. I immediately started to walk away and head back to his enclosure. As I was doing so, I felt a prick on my hand and thats when I realized he was biting me. I'm actually kind of proud of myself from not pulling away and possibly injuring him. I thought he got me twice but after looking at my hands, it looks like 3 bites. The kids and wife were not freaked out which is good. I explained it was 100% my fault and that Phantom was just scared. I look at it as a learning moment as well an opportunity to teach the family. 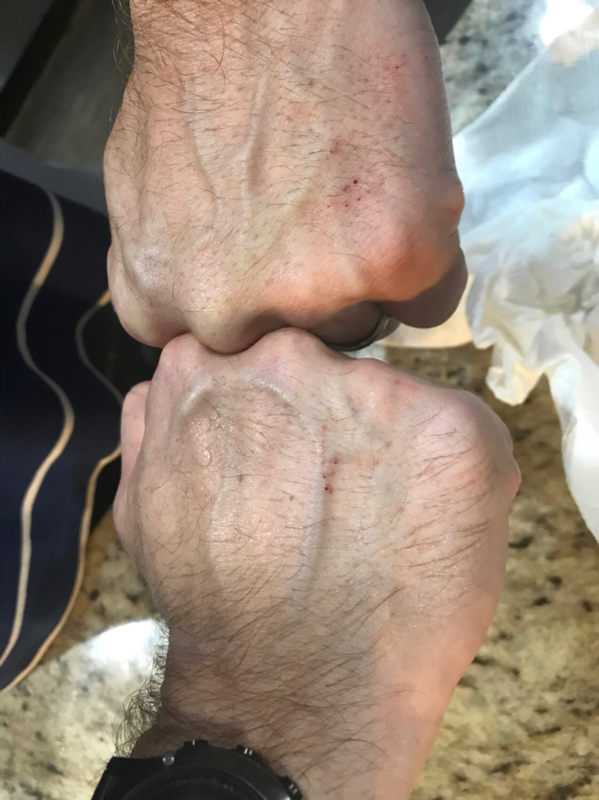 Bite Club Initiation complete . Wear it as a badge of honor sir. Glad you and Phantom are both ok. Sounds like the lesson was learned now let bygones be bygones.